I like the fact that the Atomic theme looks different to the majority of portfolio themes you see these days. First off, it has a fixed width design. Nearly every portfolio theme I see uses full width layouts. Obviously you could change Atomic to a full width layout is you wanted to but it works well with a fixed width and I like the fact that it doesn’t blindly follow other trends. The homepage uses a very uniform, simple grid structure. For some people, this may look too plain but it does result in a very clear, easy to use website. Each section is clearly laid out and well organised. There are sections for services, work, team members, news and a contact form. There is nothing that particularly stands out here but I like the way Array Themes utilise simple, logical layouts rather than cramming in as many trends as possible like some premium themes tend to. Array always do a great job with the typography in their WordPress themes and Atomic is no exception. The typography choices are perfect and everything is very clear and easy to read. Both blog and portfolio pages are well laid out and Array manage to use only default WordPress functionality to create gorgeous content. Atomic also has wooCommerce compatibility and this support doesn’t feel like it’s been shoe-horned in quickly. The shop pages have been designed with Array’s typical pixel perfect precision and look very nice. This theme could easily be used as a fully featured ecommerce theme or for selling a handful of items related to your portfolio. My favourite thing about Array Themes is how easy it is to get started with them. As you wont find any page builder or other bloat within their themes you really can be up and running in minutes. This makes Atomic perfect for anyone wanting to set up an effective portfolio quickly and doesn’t have the time to go through hundreds of theme options tweaking things. Array Themes come with a getting started dashboard which explains everything you need to know to set up the theme. This is really useful for people with limited WordPress knowledge. If you have used WordPress before then it’s unlikely that you will even need any documentation for Atomic. 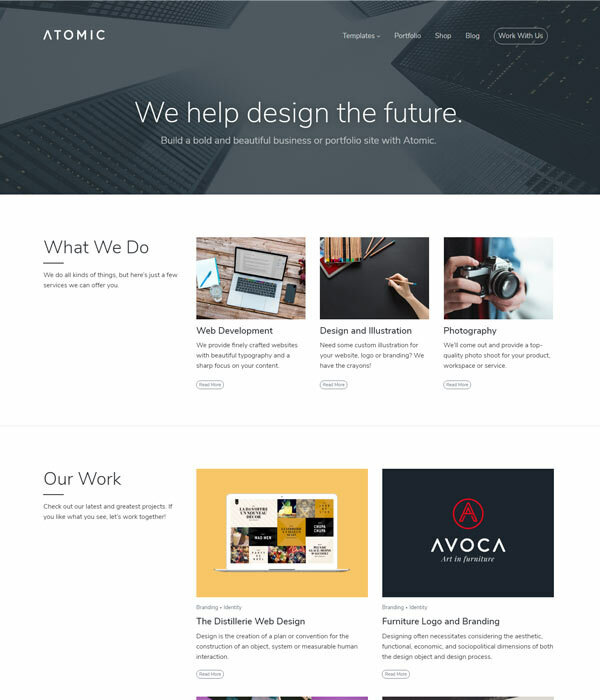 A great WordPress theme for anyone wanting a portfolio, business or shop website. You cant go wrong with any of Array’s WordPress themes. If you love simple, elegant designs then you wont be disappointed with Atomic.